That'll be another year then. Glory. It had its moments. And some of them were just amazing! This picture is of me & Matty walking this morning. I guess here's to the next. "I have summoned you by name, you are mine". That's from Isaiah isn't it? In the evening I had a little party. Well, a supper. Dad came down & a few friends came too. We had a lovely time - nice and relaxed. A huge leg of lamb. And a Dalek birthday cake courtesy of Kirsty. What more could anyone ask for? Until this morning I had no idea who this man was. I now hope he brings down the current British government. Don't get me wrong - in my job I find it only fair to be completely non-party political. I'm not abandonning that. And I don't for a moment think that the Tories or the Lib-Dems are an intrinsically "better" ticket. But the arrest of an opposition spokesperson for making known facts which the government would rather keep hidden is something which belongs in Mugabe's Zimbabwe or Stalin's Russia. We expected athletes to be wearing T-shirts about it in Beijing, though it seemed none of them had the courage. Yet it happened here. In Britain. Yesterday. 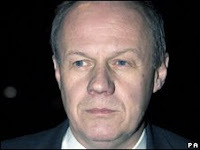 The government deny any knowledge of the police action in advance (amazingly the police timed their raid on Damian Green's parliamentary office for a day when there would be no MPs present to stop them - or they really would have had a fight on their hands). This was just a police operation (I'm sorry, when did we become a police state?) - but even if this was the case, in the name of democracy the Prime Minister should be publicly spitting feathers. Is he? Of course not. And that nine counter-terrorism officers were used in the operation makes it even worse. There are gunmen in Mumbai, and a Tory spokesman on immigration is being chased by nine counter-terrorism officers. Arrested. Spending nine hours in jail. No charge, obviously. If this is the political world we live in now thanks to a decade of the current regime, I hope that the previously unheard of Mr Green (no relation) precipitates a regime change. As Christians we believe in certain things: freedom for the oppressed, sight for the blind, justice for the poor. Last Sunday we had the back end of Matthew 25 as our Gospel reading - when I was hungry you fed me, when I was in prison you visited me. It's Matthew's equivalent of the Good Samaritan, the Second Commandment seen as evidence of the First Commandment, because both exist inseperably together. Loving God and neighbour are not options, either/or, "attempt one of the above", but indivisible realities. We see how we love God by how we love the people he has made. And thus he judges us. I'm glad I'm not Gordon Brown. If I was him, given the strictures of this parable I'd be worried Jesus would be putting me on the left just about now, and that wouldn't be a political statement. The Bible and other religious texts, books about the general philosophy and theory of religion. You don't mind thinking about the unknown or other very big ideas. You will never feel like your work is finished. The 200-series is dominated by Christian topics, so you may feel like you're constantly surrounded by Christians. Faddy, stubborn, always restless. My word, I feel like a book - completely read! You're connected to your past and value the things that have happened to you. You've had some conflicted times in your life, but they've brought you to where you are today and you don't ignore it. If I ever get this book finished, you will appreciate that this is stunningly accurate. And that 905 is in the overall setting of "History and Geography" for a character who spends a lot of time working on time and place - well, I think I am more amazed that it works for figment of my imagination than I am that it hit the mark for me, Camillofan & Richard Wood combined! Now how can I find out if it does Lottery numbers? GOING to church every week can help you live longer, say scientists. In fact, attend two services a week and you can cut your chances of dying by 20 per cent. “There is something going on here that we don't quite understand," he added from his base at the Albert Einstein College of Medicine in New York. The findings, published in the journal Psychology and Health, were based on interviews with Christians aged 50 to 80. They came from all denominations and were questioned over eight years. Now, far be it from me to question "scientists". Especially from such a prestigious place as "the Albert Einstein College of Medicine". Lies, damned lies and the Daily Express. As Benjamin Disraeli so succinctly put it. The Pontypridd Town Lights have been switched on. It's official. Christmas is coming. Thanks again to the town council for putting a fifty foot tree outside St Catherine's (Christmas, it seems, is at St Catherine's; other churches are available) and for lighting it up so nicely. I love it every year, and am delighted that it has become a part of the town's festivities. And yes, we are five weeks away (goodness, only five weeks) from C-Day itself, but life is already beginning to fill with Seasonal Joys. One of the schools that comes for their Christmas Concerts has lined up an extra rehearsal next week. We are hoping they will send some kids to take part in the Town Carol Service here on Dec 21st. And I spent part of tonight writing a carol for our choir for the TCS: a rollicking 6/8 Alleluya carol, with lots of 7ths and stuttered rhythms in it. (Later) Ooh, ooh - I just found one of my all time favourite Christmas Classics on YouTube! Sadly I can't embed it, so you'll just have to click here and go have a look. OK, you might realise from the band leaders introducing it why this band didn't last a long time (great music, not so great showmanship..? Perhaps they could have sold themselves more confidently?) but - get past that: this is Prokofiev at his best. Russian music as only Americans could play it. And it always makes me think of Christmas. I was once in Bethlehem, and the rest of the party were taken by our hosts to a Palestinian refugee camp. I refused to go. Not because I was taking a pro-Israel stance, but because I felt we were being sold half a complex story, and I didn't want one of my major emotional memories of that trip to be something I didn't know if I could trust. So I went by myself to the Church of the Nativity. It was a Tuesday or a Wednesday, just after lunchtime. There were no crowds, except for a local party celebrating a wedding! A wedding in the Church of the Nativity. How lovely. 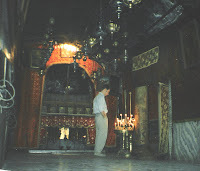 I stood and watched for a while, then made my way over to the entrance to the crypt that is the accepted site of the stable where Jesus was born. No queues. No people at all. Just the steps down and that unadorned lightbulb hanging over the doorway. And I thought, "How far from heaven is this." Which is when it made sense. How far from heaven is it? And isn't that the point? How far from heaven is my life? And didn't he come for me? And I was almost in floods of tears, tears of gratitude, just as I stood there, alone. When suddenly there was the most Christmassy sound. I couldn't place it. It was so Christmassy, so right, and yet so not what I expected - the connotations weren't working for some unfathomable reason. I looked around, trying to see what might be making this sound - and then from the top of the steps into the crypt appeared an enormously bearded Orthodox priest, waving a thurible full of incense, probably some part of the wedding ceremony. And I wanted to laugh out loud. For the chains on the incense holder were going hell for leather, rattling against each other, and there was my Christmassy sound. No wonder I couldn't place it. 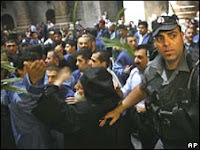 It really wasn't something I expected in Bethlehem, on that afternoon almost exactly 17 years ago to this day. Because for all the world, it sounded like sleighbells. So I love that YouTube clip - it reminds me of the Stable; and I love all the sentimental trashy music we hear from now till December 26th. Because there is something in it which, no matter how far from heaven, is for me forever Bethlehem. Looks terrific, I think. There's one shot of Spock in there that's a treat. Nice action feel to it. Simon Pegg's Scotty sounds right (looks like Simon Pegg). Maybe we'll forgive Chris Pine for not being anything like William Shatner. But it does look terrific. Thank God John Sergeant is out of Strictly Come Dancing (Dancing With The Stars UK version, for our US readers). Why? Because now Kristina Rihanoff is all mine. Oh yes. I'm sorry, it's been nice having the BBC's chief political correspondent make a total fool of himself week after week. And I totally agree with him that the public should decide this, not the judges - especially after they have excercised such outright bully boy tactics. But John, Kristina is wasted on you. There she sat on Claudia's couch tonight, crying, and you just let her. Shame on you. She is the brightest thing on TV. I mean - goodness. It's not just her dancing and (oh so) clever playing of the partnership & the show - it's her comments before & after each dance I love. Her amazement they got away with it. Here's a great summary of their early career on the programme. In case you missed this most surreal of moments the other week, here it is for you. I'd forgotten that it is prefaced by Sylar/soon-to-be-Spock and of course Sir Trevor MacDonald (think a black Dan Rather, for our US readers); and then enjoy what follows. Doctor Who, flanked by guardsmen, and wearing casual evening dress, during the interval at the Royal Shakespeare Theatre in Stratford where he was then playing Hamlet, announces to the nation (via a packed Royal Albert Hall & the National Television Awards) that he is abdicating as the Doctor in a year's time (presumably to give us, his grieving subjects, time to console ourselves). This announcement is on prime-time TV. And includes the aside that he has to go and kill Patrick Stewart - Captain Picard, of course, to Trekkies, though Claudius in the production of Hamlet in which Tennant was starring. I love Doctor Who. I think DT has been fantastic. But for sheer OTT ratings, this is simply off the scale. Anyway. Our evening service needs a bit of direction. I mean - it's lovely, but it needs a bit of direction. A bit of new purpose and life. And chatting to Helen Rees at the Glamorgan University Chaplaincy right at the start of October it struck me that Cafe Church was something we should do. So I got the Tuesday homegroup on board to help out organise things (there's a lot of set up to get the atmosphere right - tables, table cloths, candles, cakes, drinks, clean up afterwards, music, etc etc) and tonight was the first attempt. Everyone loved it. The ambience. The setting. The use of video and screen (pretty limited, but effective), the relaxed worship, the use of conversation around the tables within the teaching, the quality of cakes and drinks - and the spiritual punch of the whole thing as we felt Jesus in the midst. There's lots to learn; stuff to improve on. We have the space, the facilities, the manpower. It takes a bit of imagination. And then determination. And the pay off - personally for me, I felt the freest in worship I have felt for a while in an evening service; everything worked. And given that right now I am tired and not on top form that is saying something. And that sense of the presence of Jesus in the midst was gentle but palpable. And a very welcoming place for a couple of new people who were with us tonight, who both seemed really keen to be with us. In a couple of months time, it will be thirty years since I first turned to Jesus. I had a conversation last night in which one of the prayers I have prayed for the best part of thirty years was answered. I guess maybe it has probably always been answered, but last night I heard it with my own ears. Sometimes you miss these things, sometimes you don't see what's there, and sometimes it just takes a while for the answers to come. Glory. Now I am asking for more of the same. For more of the same. I accept over the years I have had a few unusual moments myself. I recently bought on Amazon a fantastic CD of orchestral music by Gerald Finzi, including his Eclogue for Piano and String Orchestra. Here's a (slightly less than excellent but still OK) version on YT. Why is this unusual for me? Cos it's one of my top ten pieces of music ever. Ever. I heard it when I was fifteen in an English lesson, with Eric Whittle. He used it to tell us what it meant to be a man. I don't remember a word of what he said, but I think he communicated perfectly. Of course, there are things one should not own up to (liking harmonicas, knowing the name Larry Adler - Camillofan, honestly!) and I resisted putting any links up to SClub7 videos on that basis. Or confessing I am enjoying seeing Rachel Stevens every week on Strictly Come Dancing. When I read this story, I realised that even on the days I think life has been tough, I've had it easy! Today is Remembrance Sunday, and to tell the truth I always find preaching on this day one of the hardest things. We have an unusual mix in church: our own folk, who want to be fed spiritually; ex- and serving-military who are there for the day to remember colleagues who have suffered and died, and their own time in service; and various youth organisations, from the Brownies to the cadets, many of whom are there because they have been told to be! Add to these a sprinkling of civic dignitaries from the police, the fire services, the life boats et al, and of course a good deal of political presence (from a government minister downwards), and you have a full church (actually today a very full church - the fullest we have had on Remembrance Sunday in my time here). And I have to speak to them all. You'll understand that I lay awake half the night even after working solidly on my talk, running it over and over, making sure that I was happy with what I was doing. Because, being me I am not happy to do a simple thing - I wanted to deconstruct Remembrance, to pull apart what we think we are doing on this day and then to put it back together in a way that has an integrity and a Christian emphasis and life that points forwards not backwards. I was helped enormously by Cameron Curry (aged 11) who brilliantly read out On Flanders Fields at the start of my talk,and by Matthew Truelove who sang Enrique Iglesias' Hero towards the end (far better than the original - the boy is far better than he knows, and we are blessed to have him). I contrasted nostalgia, vengeance, national pride and sentimentality, and called for remembering that recalled the past accurately so that we could build a better future; remembering that was pulled into a cathedral of forgiveness by the one who laid down his life for his friends and cried "Father forgive" so that we cannot forget and be lost in an endless cycle of war without end; remembering that takes pride in its country but sees humanity in its fellows in all lands because all recieve from Jesus the right to be treated as neighbours, to be blessed and not cursed, to be loved and not hated; and remembering that sees a hero in an act of bravery for a fellow in the midst of an inexplicable war, but does not lose its context or its sorrow as we honour that bravery. Remembering must drive us to make tomorrow better than yesterday, and this cannot be done if we ignore truths about today, or simply dwell on the past. Those who died that we might be better off are badly served if simply sit around remembering how good it used to be. We remember - lest we forget: so that the youngest will never know what the oldest have seen, and the oldest might never imagine what the youngest will take for granted. And it poured down as we set out for the park, after the church service, to complete our remembering at the town war memorial. Though I had a very good chat with our MP, Kim Howells, who told me that the chap next to him in church (mercifully anonymous) had said: "Marcus was good this morning; he's not up to that standard every week, you know." I'm not asking you to post your own (well presented, rapped and captioned) videos - just your comments. If you had a minute to precis the Bible, what would have to be included? Or have these guys just about got it right? So you wonder what happens in the Vicarage at the end of a busy Sunday? All that preaching & evangelism and worship is done, and the dog & I just dance for joy. Any excuse. And yes, those of you who have only seen Matty being shy and quiet and have never heard him bark - that really is him! He just saves his voice for his master. Like his master, really. O you think you've heard me? You should wait till it's just me and the dog and Jesus in the room. Like Matty, I save my voice for my master too. I'm sure I commented on my recent trip to Florida about how impressed I was with my nephew's school band. Here is an audio file of them playing at a recent event. They had the music for two weeks bfore the concert, and this is them playing 'live'. All the kids in this band are 12 and 13 years old. Fantastic job Mr Leahy! Fantastic job Ben! Fantastic job everyone! Wow. I wish I'd had the chance to be a part of a band like that when I was at school. Amazing.